Recombinant fragment within Human Bcl-2 aa 1 to the C-terminus. The exact sequence is proprietary. WB: Human tonsil lysate, Human thymus lysate; Jurkat, U-937, THP-1, HeLa, C2C12, WEHI -3 and NIH/3T3 whole cell lysates; Mouse brain lysate, Mouse heart lysate, Mouse kidney lysate, Mouse spleen lysate, Human fetal kidney lysate, Human fetal spleen lysate. 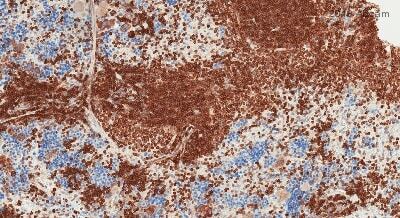 IHC-P: Human tonsil tissue, Human endometrial cancer tissue, Mouse spleen tissue. ICC/IF: Jurkat cells. Flow Cyt: Jurkat cells. Our Abpromise guarantee covers the use of ab182858 in the following tested applications. WB 1/2000. Detects a band of approximately 26 kDa (predicted molecular weight: 26 kDa). Lanes 1 - 4: Merged signal (red and green). Green - ab182858 observed at 26 kDa. Red - loading control, ab8245, observed at 37 kDa. ab182858 was shown to specifically react with BCL2 when BCL2 knockout samples were used. Wild-type and BCL2 knockout samples were subjected to SDS-PAGE. Ab182858 and ab8245 (Mouse anti GAPDH loading control) were incubated overnight at 4°C at 1 ug/ml and 1/10000 dilution respectively. Blots were developed with Goat anti-Rabbit IgG H&L (IRDye® 800CW) preabsorbed ab216773 and Goat anti-Mouse IgG H&L (IRDye® 680RD) preabsorbed ab216776 secondary antibodies at 1/10000 dilution for 1 hour at room temperature before imaging. Immunohistochemical analysis of paraffin-embedded human tonsil tissue labeling Bcl-2 with ab182858 at 1/1000 followed by Goat Anti-Rabbit IgG H&L (HRP) (ab97051) at 1/500. Cytoplasm, nuclear membrane and nucleus staining on lymphocytes of Human tonsil tissue is observed. 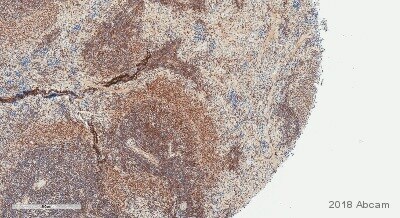 Negative control: Used PBS instead of primary antibody followed by ab97051 at 1/500. Flow cytometric analysis of 4% paraformaldehyde-fixed Jurkat (Human T cell leukemia cells from peripheral blood) cells labeling Bcl-2 with ab182858 at 1/250 (red) compared with a rabbit monoclonal IgG isotype control (ab172730) (black) and a unlabelled control (cells without incubation with primary antibody and secondary antibody (blue)). Goat anti rabbit IgG (FITC) at 1/500 was used as the secondary antibody. Immunofluorescent analysis of 4% paraformaldehyde-fixed, 0.1% Triton X-100 permeabilized Jurkat (Human T cell leukemia cells from peripheral blood) cells labeling Bcl-2 with ab182858 at 1/150, followed by Goat anti-rabbit IgG (Alexa Fluor® 488) (ab150077) secondary antibody at 1/1000 (green). Confocal image showing cytoplasmic and weak nuclear staining on Jurkat cells line. Tubulin is detected with ab7291 (anti-Tubulin mouse mAb) at 1/1000 and ab150120 (AlexaFluor®594 Goat anti-Mouse secondary) at 1/1000 (red). -ve control 1 - ab182858 at 1/150 followed by ab150120 (AlexaFluor®594 Goat anti-Mouse secondary) at 1/1000. -ve control 2. - ab7291 (anti-Tubulin mouse mAb) at 1/1000 followed by ab150077 (Alexa Fluor®488 Goat Anti-Rabbit IgG H&L) at 1/1000. Immunohistochemical analysis of paraffin-embedded Human endometrial cancer tissue labeling Bcl-2 with ab182858 at 1/1000 followed by Goat Anti-Rabbit IgG H&L (HRP) (ab97051) at 1/500. Cytoplasm, nuclear membrane and nucleus staining on lymphocytes and cancer cells of Human endometrial cancer tissue is observed. Blocking and diluting buffer was 5% NFDM /TBST. Immunohistochemical analysis of paraffin-embedded Mouse spleen tissue labeling Bcl-2 with ab182858 at 1/1000 followed by Goat Anti-Rabbit IgG H&L (HRP) (ab97051) at 1/500. Cytoplasm, nuclear membrane and nucleus staining on lymphocytes of Mouse spleen tissue is observed. Publishing research using ab182858? Please let us know so that we can cite the reference in this datasheet.